We love My Father's World Kindergarten, and to wrap up unit one, a study of the sun, we made raisins. We actually set up our grapes on day one of our sun study, but of course it took over a week for our grapes to become raisins. 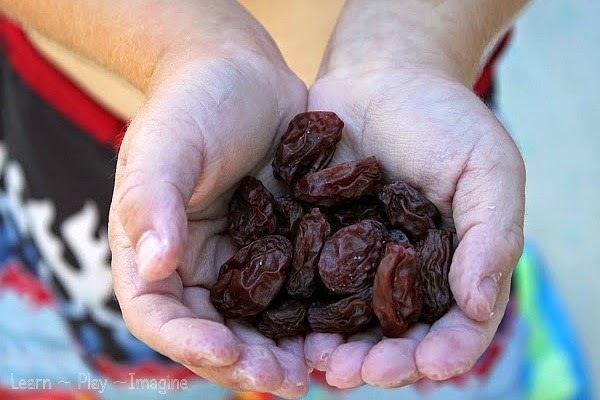 J-Bug (5) was so proud of his raisins, and he checked on them everyday, eager for them to be done dehydrating. This sun science activity was also a lesson in patience. First J-Bug picked a couple handfuls of grapes and rinsed them clean. We used this step for counting practice as well, as he selected twenty five grapes. When they were clean he carefully set them out on a paper towel on top of a plate, and our grapes were ready to be left in the sun. We have a sun window behind our kitchen sink, so we left them inside in the window. When we made raisins when JZ was in kindergarten we left them outside. My toddler twins weren't mobile back then, and I didn't want them to be left within reach just to be safe. We checked on our grapes/raisins every day, sometimes multiple times each day, per J-Bug's request. He kept an observation chart full of drawings of the progress of the raisins. After almost two weeks we had plumb, juicy raisins. J-Bug was so excited and so proud. For more ways to learn about the sun follow me on Pinterest. That is awesome. I would have thought they would mold before they turned into raisins. Hello! Thank you for posting this! I worry about ants. Will this experiment still work if they are in a sealed container, at a window?